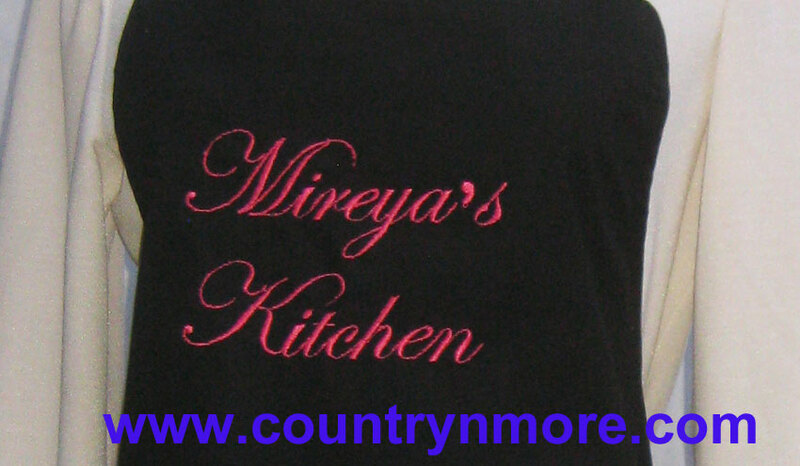 We just love the elegant font used to embroider the bbq aprons. 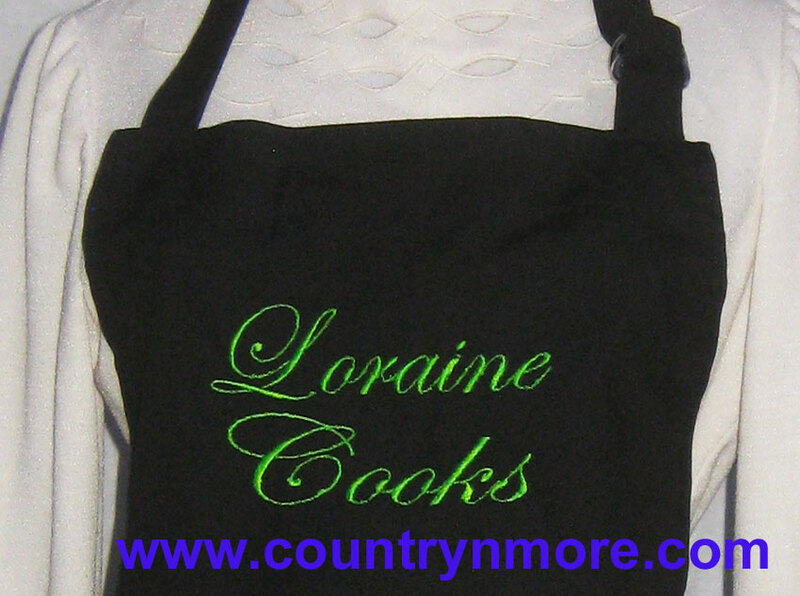 We recently received a request to create personalized bbq aprons for a customer. 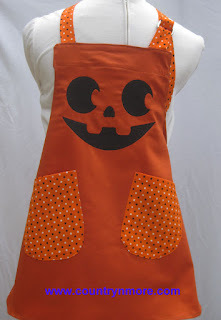 The recipients of the aprons are all happy with their unique gift. 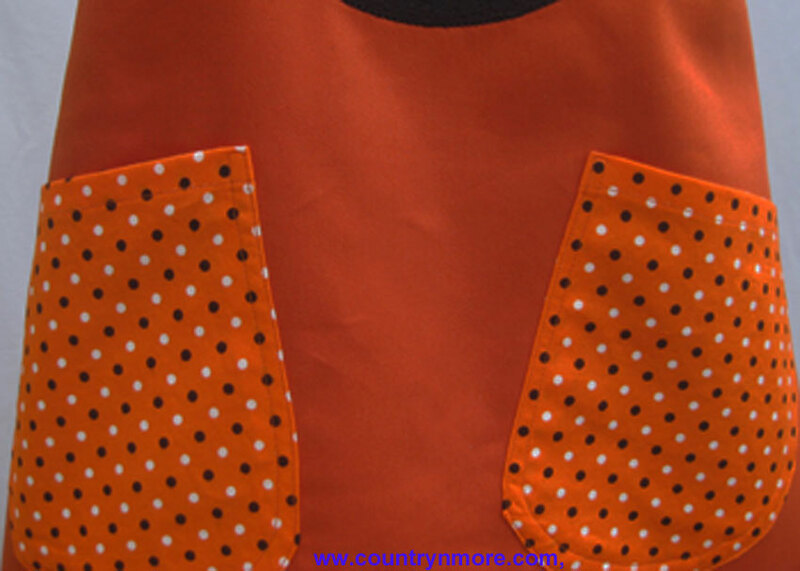 Instead of using mass imported aprons, we make all of the aprons at Country N' More. We use 65% polyester, 35% cotton fabric for all of our aprons. 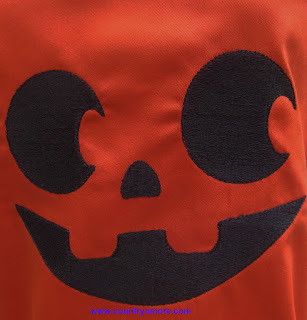 The black fabric is the most popular, but we also have it in navy blue. These aprons are popping with their bright color embroidery thread. 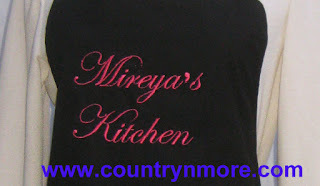 Mireya's Kitchen was done with a hot pink embroidery thread. 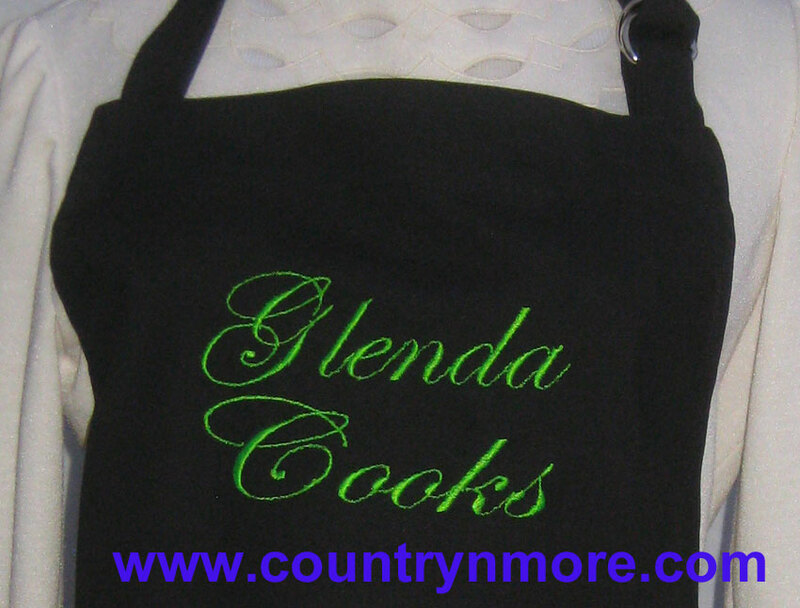 Glenda Cooks and Loraine Cooks were both done in a neon green. It is so gorgeous. Well....I think that this is the last of the harvesting of fruit for this year. 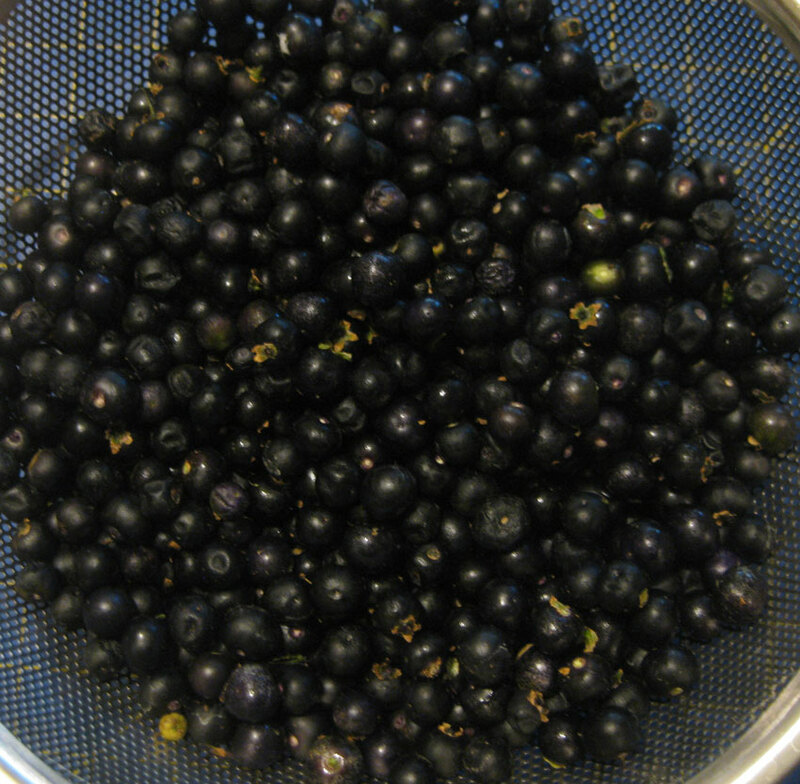 The huckleberries are ripe for the picking. I usually will immediately turn them into delicious jam, but this year will be different. I am going to freeze them. Our poor refrigerator. 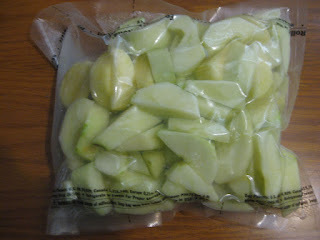 It is overflowing with frozen apples, grape juice, along with our other frozen goods. This year's crop is larger than last year. I am thinking of using the jam recipe from food . com. 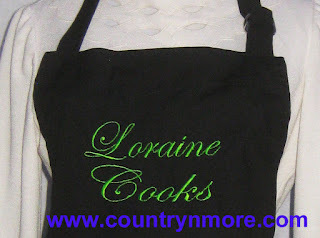 Now, it is time for countrynmore.com to get back to making some custom aprons for a customer. I will post pictures when I am done. Apple Picking-Preparation Applesauce, How To Freeze Apples, etc. Well...this is not Country N' More that is doing the picking of the apples, rather the harvesting of the Fuji apples from our apple tree in the back yard. Many of the apples have fallen victim to the local squirrels, while others have been victims of the codling moth. Despite these downfalls, we still had plenty of apples to pick. This year showed a bumper crop. 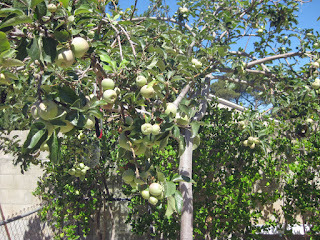 The squirrels of course would go after the large apples. All in all, we still had plenty of apples to pick. I know for sure that the squirrels were not happy with us for taking the fruit. Every day we would see the remains of an apple enjoyed by the local squirrel, while other apples were knocked down on the ground. I was asked by a friend if I weighed the apples, because I mentioned that I thought that there was over 30 lbs. This made me think...."How many pounds of apples were left on the small tree out in the back?" So...I weighed the smaller box, which was abundant in itself. The total weight of the apples in this 13 1/2" x 14 1/2" by 9 1/2" tall box was 24 lbs. This leaves the larger of the two boxes, which is about double the size of the smaller size. The total combined weight of the apples picked this year. Drum roll please....65 lbs. Whoa! 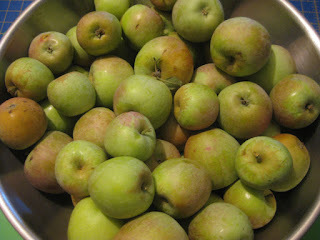 I am looking forward to using the apples to make apple pies, cake, apple pancakes, etc. This large box is heaping with apples. 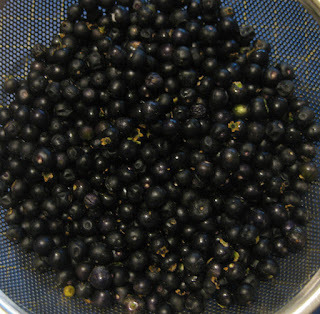 The very small ones will be made into juice. 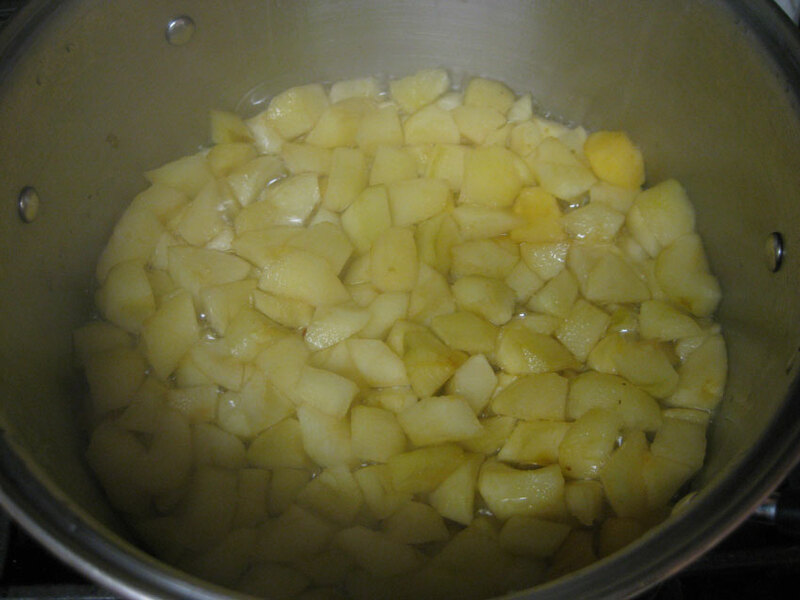 I have already started making home made applesauce. This year, I am going to try freezing apples. I don't know why I haven't thought of it before. I have canned apples, but never froze them. These apples are going to be sliced and frozen. There are still plenty of apples in the second box. I will post updates when I weigh the second box. All I can say, "It is heavy!" Tip: I poured lemon juice in a bowl. I add the slices to the lemon juice in the bowl. 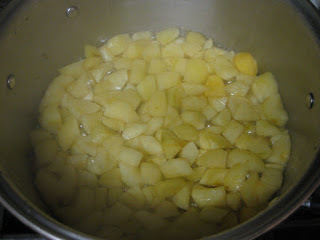 When ready to freeze, I just pick up a bunch of apple slices, shaking off any excess lemon juice. This works well for me. The apples are then vacuum sealed. I have to give credit where credit is due. 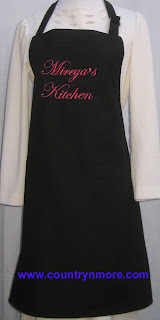 These cute aprons were the inspiration from a dear customer and friend. 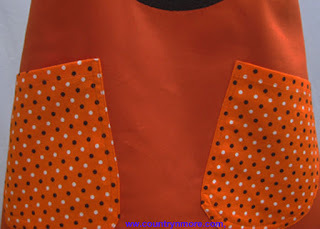 I chose to use a black and white polka dot print for the pockets and straps. These cute aprons are available at countrynmore.com. The links will take you to the page on our website.